Both of these approach have drawbacks of their own. The first approach consumes more screen space even if you are adding only few records. So it is not a good option in "edit mostly add few times" scenarios. The second option calls for creating an extra web form and because of to and fro navigation more requests are sent to the server. In this article I am going to illustrate a quick way to solve the above problems. 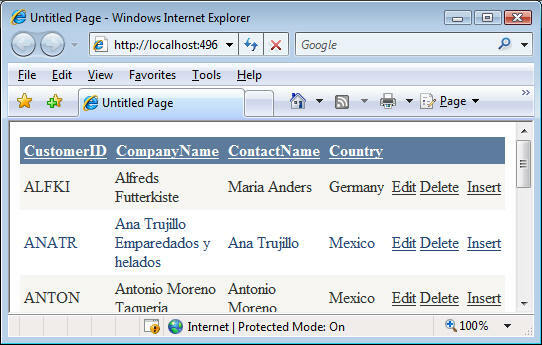 The GridView control provides a template called Empty Data Template. This template is displayed when there is no data to be displayed in the GridView. 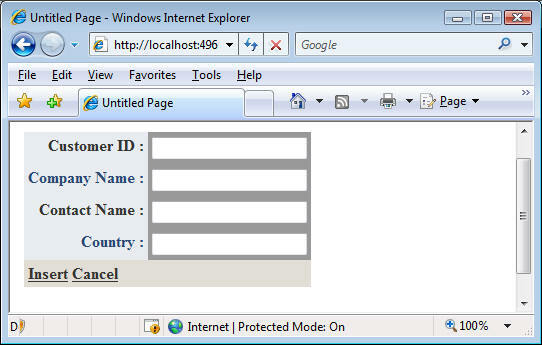 Normally this template is used to display a status message to the end user that there is no data to be displayed. However, you can use this template for any other purpose also. In this example you will use it to add a new record to the GridView. Begin by creating a new web site in Visual Studio. 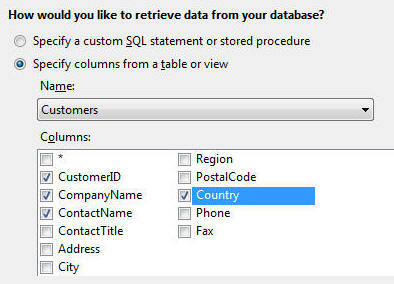 Drag and drop an SQL Data Source control and configure it to select CustomerID, CompanyName, ContactName and Country columns from Customers table of Northwind database. 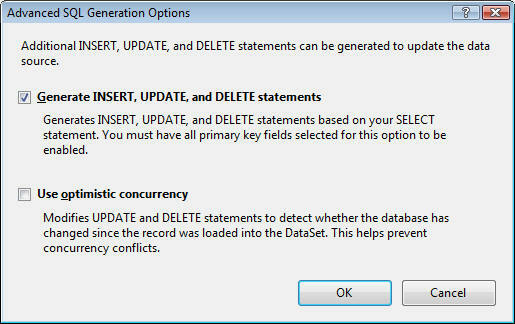 Make sure to choose Advanced button and select "Generate INSERT, UPDATE and DELETE" statements checkbox. Now add a GridView control to the web form and set its DataSourceID property to SqlDataSource1. Also enable editing, deleting and paging for the grid. From the smart tag of the GridView select "Edit columns..." option. 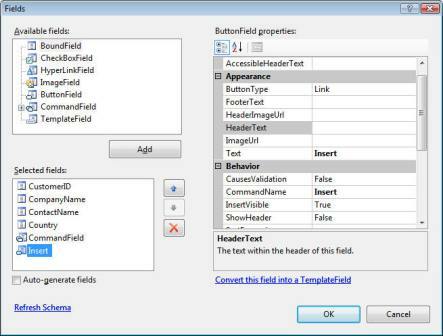 Add a ButtonField to the grid and set its CommandName property to Insert. Users will click on Insert button to insert a new record. Now right click on the GridView and choose Edit Template - Empty Data Template menu option. 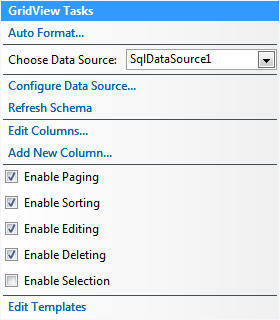 Drag and drop a DetailsView control inside Empty Data Template and set its DataSourceID property to SqlDataSource1. Also set its DefaultMode property to Insert. 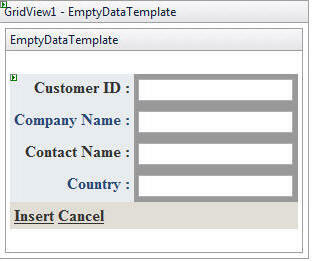 This way when the Empty Data Template is displayed the DetailsView will be ready for insertion. Here we check if the CommandName of GridViewCommandEventArgs class is Insert. If so we set DataSourceID property of GridView to empty string and call DataBind() method of GridView. This way the grid will not have any data and Empty Data Template will be displayed. Here we set DataSourceID property of GridView again to SqlDataSource1 and bind it again. This way the grid will reflect the newly inserted record. The following screen shot shows our web form in action. GridView control does not allow you to insert new rows. However, with the help of Empty Data Template and DetailsView you can play a clever trick to insert new records. This way you can save screen space as well as extra pages.